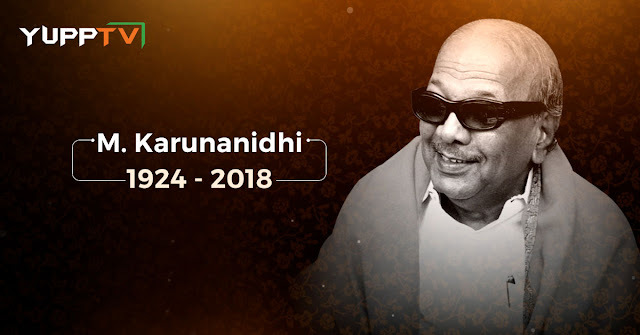 A great Leader, one of the longest-serving politicians of Tamilnadu, 5 term CM, Screenwriter, Poet, Novelist, and a contributor to Tamil literature, Karunanidhi, popularly referred to as Kalaignar passed away at the age of 94 on 7th August 2018. The man who was loved by the Tamil audience was a long-standing leader of Dravidian Movement. From a screenwriter to a leader to a Politician Karunanidhi's life serves as an inspiring tale to all the leaders of the future. Karunanidhi’s movies contained strong social messages and arose controversies among the conventional Hindus and were severely subjected to censorship. His notable movie Parasakthi which supported the Dravidian movement became a blockbuster hit and introduced actors like Sivaji Ganesan, SS Rajendran to the Tamil industry. He then went on to make films like Panam, Manohara, Thirumbi Paar, etc. He also contributed to the Tamil literature by writing Poems, Books, Letters, Novels, Biographies, Historian Novels, Stage Plays, etc. Through his wit and oratory skills, the man soon rose to be a Politician and then went on to be elected 5 times as a CM of Tamil Nadu. He was serving as MLA of Thiruvur constituency before succumbing to the illnesses. The man was highly respected among the Tamil Political circles and has received many Awards and Titles. He had three wives and is succeeded by 6 children among whom M K Stalin, M K Muthu, are active in Tamil Nadu Politics and Kanimozhi is reputable as her literary heir. Tamil Nadu government declared a public holiday on August 8th and a seven-day mourning after his death. The government of India declared national mourning and on 08th of August with orders to fly National Flag at half mast in Delhi and all the state capitals. His body was buried near Anna memorial at Marina Beach where leaders like M G Ramachandran and recently deceased Jaya Lalitha had been buried.